Traveling is one of those things that every business wants to do with their employees but you may not have the proper funds. Now, there are a few remedies such donations and other fundraisers. However, a more efficient way is to use the Business Travel Budget. This simple template is the best tool to organize your monthly income and any donations/contributions in such a way that you can easily start saving for that big trip. No more putting it off until next year, simply because you don’t have the funds. The Travel Budget is here to help you prepare for your employee’s dream vacation. The first step will be to download the template to your computer. Simply click the link located at the bottom of this screen to get started. The top section of the document allows you to enter any forms of income. As mentioned above, you can enter monthly savings from your company doing well, individual donations, and any fundraising money into this section. Now, you’re going to have to do some research in order to find out how much your trip will cost. The template provides you with some pretty common examples of your trip. If you want, you can track your employees and their pay during the trip, specialist fees, advertising costs (for business trips), and travel/accommodations. Remember, you can change any of the examples or add more simply by clicking inside a cell and typing something new. After you have gone through and entered all your possible expenses, just compare your funds with the cost. 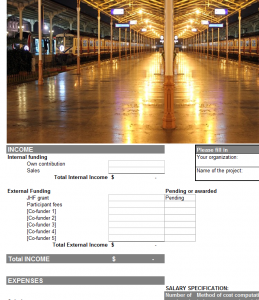 This template gives you a neat and clean way to organize all your different fundraising projects and get you one step closer to your business trip with maximum efficiency.